News from Sooner Foods in southern Oklahoma serving grocery customers since 1954. Here are the items in our one day in store sale this Thursday. These are items that are in addition to our regular weekly ad. See you Thursday at our Big In Store Sale 7 a.m. to 9 p.m. If you won't to surprise someone with a special birthday, celebration, anniversary, or other offering, then consider the cake creations by Debbie Smith in our Sulphur Bakery/Deli. Debbie can craft you a cake that will create memories forever. 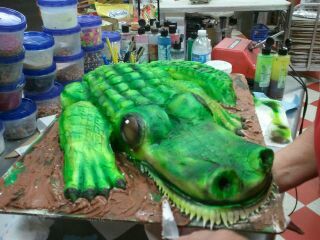 Swamp People Gator cake created by Debbie Smith.